Is there something like Animal Intelligence? Yesterday while I was busy chasing cats, I found in the stowage an old issue of National Geographic magazine. 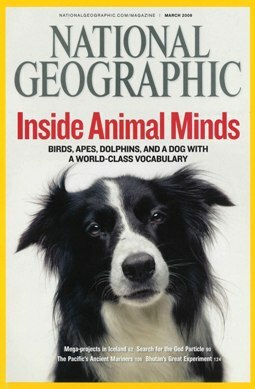 It had a cover story on animal intelligence. It made for an interesting reading. Read the National geographic cover story here. Animals are smarter than most of us think them to be. Animals have always had intellectual abilities however what fauna friends refer to as intelligence might be entirely different from human definitions. It’s like searching for life in far off galaxies, but then life forms in a particular planet may be in contrast with what we have here. To us motion, respiration, activity etc. might be vital signs of life but who knows if for a green alien in Mars life means being in vegetative state? Similar is the quest for animal intelligence and as far as I am concerned I never had a doubt about it. We have chimpanzees demonstrating team work, dolphins enchanting humans with their understanding and dogs and kittens forming emotional empathy with their human friends. We have Dogbert, the CEO dog from Dilbert comics. Hobbes, the philosopher tiger from Calvin & Hobbes and who can forget the likes of the lazy cat Garfield and heroics of Superman’s dog Krypto? Well how about this, Betsy, the now famous dog has a vocabulary of more than 300 words, knows 15 people by name and can retrieve objects seen in photographs or the deceased parrot Alex who gave avian intelligence new dimensions with his smart as a whip behavior. Do Scientists believe in Animal Intelligence? Still got doubts? Look into the eyes of any animal in your vicinity, if you look with belief you would for sure see the warmth of love. And believe me; any species capable of loving is for sure, intelligent! Hi Kalicharan, You are so right about that last thought. Makes us wonder about some humans…well, you know what we mean!! Sorry we have been very irregular about coming over for visits. and also we haven’t got to writing that guest post we had ppromised to do earlier. Just Mummy’s fault, you know, she hasn’t been able to find enough time. Besides we want to make it special and not write something in a hurry. Hands down and I agree dogs and other animals are quite intelligent and have emotions and they can connect with us humans on that wavelength .. In one of the documentaries on dogs aired on animal planet it was being discovered as to how dogs can analyze our moments, gestures & emotions and by doing so how they get to know that we are into a serious health trouble .. And can raise an alarm for us and hence save our lives ..
Pingback: 13 amazing Bollywood movies Dog Lovers need to watch! Previous Previous post: BBC finds tigers in Himalayas! Next Next post: Humans Are Our Best Friends!